The ancient Tony Kanaan will endure yet another difficult year on track, turning in his third consecutive winless campaign. Happily for TK, his lifelong frival and fellow Brazilian Helio Castro Neves won’t fair much better. James “Dancin’ fool” Hinchcliffe will lead a resurgence this year at SPM. A resurgence for SPM means merely a single trip to the top of the podium, however. AJ Foyt Racing had better be improved with its new driver lineup and Chevy engines following an earlier engineering revamp, else Super Tex sadly ought to seriously consider selling off the team’s assets and having Larry get a real job. Clamor to improve the schedule with more big oval races will reach a fever pitch this year as the oh so boring road courses continue to fizzle with fans of fast. More ovals bring more varied winners as well as more speed and more exciting racing, Mr. Miles. Aero kits won’t be missed after their final season, but rather viewed as a good (or even great) riddance. In retrospect, Andretti’s hire of Sato makes some sense in light of the kits’ obsolescence. Ditching them is one thing Miles, Frye and co have gotten correct. IndyCar’s new mouthpiece, former “journalist” Curt Cavin, cannot possibly be a bigger sycophant for the series in the future than he already was at the failing Indy Star. Expect more fake IndyCar news in the future, now straight from the top. Michael Andretti’s already erratic behavior will grow even curiouser, as his perpetual and very public mid-life crisis persists into its fifth year. On top of it all, the poor guy has to go home to a former PMOY in his mansion every night. Former f-ing F1 invader and Indy 500 winner Alexander Rossi will enjoy some near success, further making his split from billionaire Bernie a no brainer. Of course he’ll be a much hyped threat to repeat at 16th and Georgetown – until the actual race, that is. 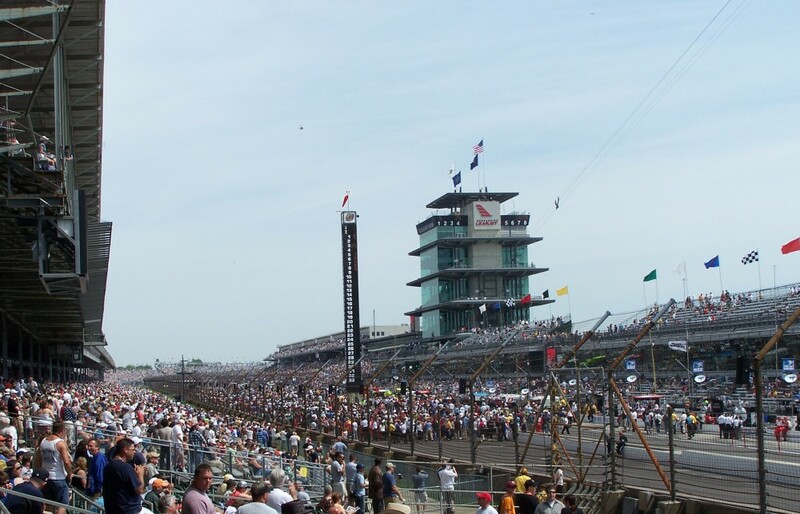 The 101st Indianapolis 500 will inevitably be a letdown after last year’s thrilling finish before a packed house at the upgraded Brickyard. As a direct result, better 500 logo art will be produced in the future. Marco’s woeful record will drag on into its second decade, with the whining and complaining hitting record levels. The guy could at least bring his fiancee Marta along to the track once in a while, for beauty’s sake. What she sees in him is more stupefying than Daffy Leigh Diffey‘s accent. The return to Gateway in lovely (for a dump) East St. Louis will be immediately regretted, especially by paying fans who’ll suffer through another Penske runaway race. It’ll be just like the last one held there way back in 2003, wedged in between those lofty landfill mountains. Ragin’ Graham Rahal will return to his winning ways of 2015 now that his first year of wedded bliss to the gorgeous Courtney Force is entirely out of his system. When in such an embarrassing spot, we just try to think about baseball . . .
Will “he’s a DAD?! ?” Power‘s wacky and wild off track instability will produce humorous headlines like “Power Blows Fuse, Again” and “Power Outage Lengthy, Widespread.” Neither these nor an ongoing lack of wins will please his overly forgiving Verizon sponsors, though. IndyCar’s most eligible bachelor Josef “top bidder” Newgarden will win his first championship, out gunning his French team mate – to everyone’s relief. Unfortunately, it’ll be for the Cap’n’s team, IndyCar’s answer to Belichick’s Patriots. This entry was posted in 100th running of Indy 500, 2017 schedule, 2017 season, AJ Foyt, AJ Foyt Racing, Alexander Rossi, Andretti Autosport, Bernie Ecclestone, Chevy, Chip Ganassi, Chip Ganassi Racing, Courtney Force, Curt Cavin, Detroit, Detroit GP, Emma Dixon, fake news, Graham Rahal, Helio Castro-Neves, Honda, Indianapolis Motor Speedway, IndyCar off season, IndyCar racing, IndyCar Schedule, James Hinchcliffe, Jay Frye, Jodi Ann Paterson, Josef Newgarden, Larry Foyt, Leigh Diffey, logo, Marco Andretti, Mark Miles, Michael Andretti, Mid-Ohio, Oval Track Racing, Penske, predictions, prognostications, Roger Penske, Schmidt Peterson Motorsports, Scott Dixon, Simon Pagenaud, Takuma Sato, Team Penske, Tony Kanaan, Twitter, Verizon, Will Power and tagged F1, Indy 500, IndyCar, IRR, irreverent humor by IndyRaceReviewer. Bookmark the permalink.